Bodacious Dream built and launched in Wellington, New Zealand in December of 2011. Bodacious Dream’s first major race was the Atlantic Cup in May, 2012. With some miraculous combination of good luck, strong winds, some skill and the prescient powers of Dave’s racing partner, Matt Scharl, they were able to take second place against some incredibly strong competition. Here’s a cool article from Sail World on the race with a video of Dave and Matt. BoDream’s next race was its first Trans-Atlantic one (and Dave’s too) and was done with a crew of four (Dave, Matt Scharl, Emma Creighton and Mark Zaranski.) The race, Transat Quebec St. Malo - from Quebec, Canada to St. Malo, France started on July 22nd and ended 12 days, 17 hours, 51 minutes and 45 seconds later on August 4th with Bodacious Dream - the first American entry ever in that race, finishing respectably in the middle of the pack – after some harrowing and unexpected events at sea. See our Captain’s Blog for the whole set of live (and pretty visceral) posts sent via satellite by Dave and Matt. Once on the other side of the “big pond,” BoDream was scheduled for a couple other big European Class 40 races. The first European race, the Normandy Channel Race, took place over the first weekend in September 2012. It began and ended in Caen, France and took a course across the English Channel and out to Fastnet Rock and back, a distance of 1000 miles. In this race, Bodacious Dream encountered unrepairable problems with the solent, and unfortunately had to retire early from the race. This was followed by the Class 40 World Championships (October 3-7) in La Rochelle, France. 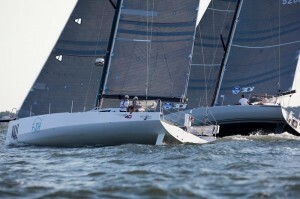 This was a series of course races over a three-day weekend to determine the Class 40 World Champion. Bodacious Dream took some big risks on the last day of racing to move up from 5th position, but those efforts proved unsuccessful, as BoDream finished the race in the middle of the pack. Still an unforgettable adventure it was. After that race, Dave took Bodacious Dream on an exciting sail to Lisbon, where the boat stayed until December, at which point Dave sailed her singlehanded across the Atlantic. On December 7th 2012, Dave sailing Bodacious Dream single-handed, departed Cascais, Portugal on his first solo Atlantic Crossing, bound for the U.S. and Charleston, SC. Early on Saturday December 29th, Bodacious Dream moored on the Caribbean island of Antigua after 22 days at sea. On Tuesday January 2nd, Dave resumed the final leg of his journey. On Wednesday, January 9th, he moored briefly in West Palm Beach, FL, before heading north towards Charleston, where he landed safely on the morning of Saturday, January 12th. The first race was the 2013 Atlantic Cup Race, completed at the end of May, which saw Bodacious Dream hold onto its lead through two tough days of “inshore” racing to WIN the big prize! Prior to the closing weekend, Matt and Dave had captured both the FIRST (Charleston, SC to NYC) and SECOND (NYC to Newport RI) “offshore” legs of the race. Our Facebook page and Captain’s BLOG on this site, carried regular updates! Here are a “best-of” set of photos and videos from the race, and Dave’s Recap of the race can be found HERE! Following Bodacious Dream’s win in the Atlantic Cup in May,the action shifted to California for the exciting Transpac Race. For this famous open ocean race, Dave and Matt, part of a crew of 9 were aboard Bodacious IV … which was the boat that sailed up the Baja Peninsula in April as host vessel for our first Bodacious Dream Expedition. The challenging race course took competitors through a myriad of unforeseen conditions: from the cold, wet northeastern Pacific, through doldrums, enormous seas, abundant squalls and scorching heat, to the blustery trade winds of the Molokai Channel near the finish. After a long and grueling voyage across a lonely expanse of ocean, which saw Bodacious IV executing a daring southerly strategy and crossing the finish line, first in their division, though their corrected finish considering handicaps was third. You can view the trail of those updates on our Facebook page and on the Captain’s BLOG on this site, and to share the discovery and learning part of the voyage, visit us on our Bodacious Dream Expeditions site. Dave’s Recap of the race can be found HERE!